Besides the on-street parking on the several blocks surrounding the theatre, there are also several parking garages within walking distance to the space. Two city-owned-and-operated parking garages, fully-lit and with 24-hour security, are located just half-a-block west of our home. The garages are beneath the Broadway North and Broadway South apartment buildings, respectively; both are open to the public and are free on evenings after 6pm and all weekend. 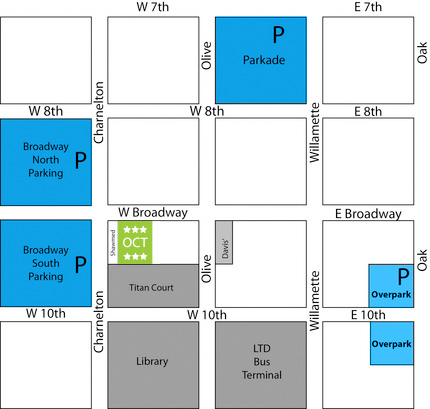 Two other city parking garages are a few blocks further from the theatre, including Overpark (entrance just north of E 10th on Oak) and the Parkade (8th & Willamette). PLEASE NOTE: Many street-level parking lots are available in the area, but payment is required in these areas. Be sure to check the signage for payment requirements. Only the parking structures are owned by the City of Eugene. Also, the theatre is unable to validate parking during times that payment for parking in city-owned structures is required (before 6pm, Monday-Friday). Get more info about Special Events like NW10, Talk-backs, Experience OCT, and more! Click here for more on Special Events! We have lots of volunteer opportunities!